Strikes are a common cause for flight disruption, whether this be the personnel of an airport or an airline. Unfortunately, as strikes are deemed by EU regulation to be beyond the airlines’ control, passengers are unable to make compensatory claims in these cases. Food and refreshments will be made available at the airport for affected passengers, and the airline is expected to organise alternative transportation as soon as they can. When am I entitled to compensation in the event of a strike? What do I need to do in the event of a strike? Is it possible to get compensation for flight disruption caused by strikes? As established by EU Regulation 261/2004, passengers can receive between €250 and €600 in cases of flight delays, cancellations or overbookings. The exception to the rule are flight disruptions caused by ‘extraordinary circumstances’. In this case airlines are under no obligation to pay out compensation to customers. Strikes, whether they be carried out by the airport staff or the airline staff, fall under this category and as such passengers should not expect to have a valid claim. However, there are exceptions to this rule, under which the airline may be held liable for damages caused by cancellations or, delays or denied boardings. In order for the European Regulation to apply, the flight must have taken off from a European airport, or it must have been operated by a European airline and landed in the European Union. These conditions apply regardless of the ticket price, and also apply to those travelling on business or on package holidays. Your claims are valid up to 6 years retrospectively. If your flight does not fall within the immediate strike period, but is cancelled due to the impact of the strike, it is worth checking your entitlement to compensation. For example: if all flights are taking off and landing on schedule again after the strike, but you are denied boarding, then there is a good chance that the airline will have given your seat to a passenger who was directly affected by the strike. This means that the airline would be denying you the right to board against your will, which could entitle you to compensation. Flight cancellations before the first official day of a strike do not exempt the airlines from their obligation to pay compensation. The European Court of Justice explained that this would deny air passengers any form of right protection if an airline could invoke incidents that it itself had the power to resolve. (ECJ, judgment of 4 October 2012). If the flight distance is up to less than 1500km, the value of the compensation is €250 for a delayed, or cancelled flight or overbooked flight. If the flight distance is between 1500 km and 3500 km, the value of the compensation is €400 for a delayed, or cancelled or overbooked flight. 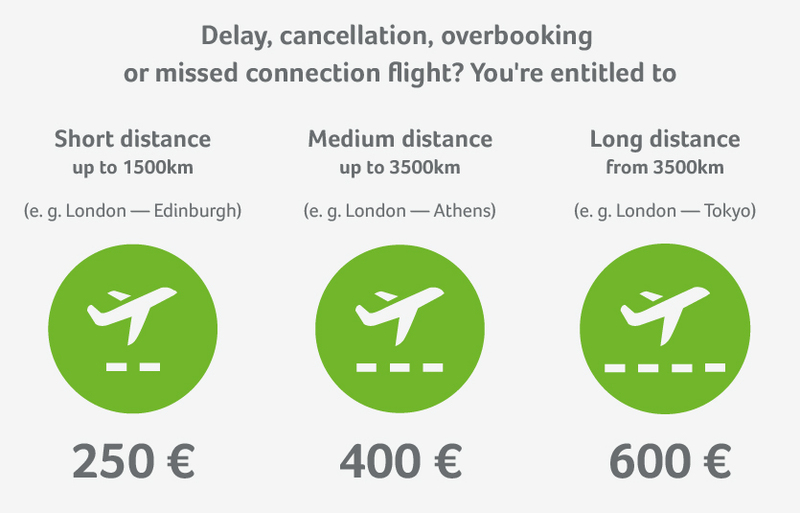 If the flight distance is greater than 3500 km, the value of compensation is €600 for a flight delay a or cancellation or an overbooked flight. Do I need to turn up at the airport in spite of the strike? Yes, it is important for you to check in on time - at least if the strike will only be lasting for a short period. The airline offers you an alternative flight at short notice. If you are faced with a longer waiting period, always remain at the gate. If the strike lasts several days, you can ask the airline in advance when your alternative flight will be taking off. In such cases, you obviously don’t need to turn up at the airport on time for the flight you had originally planned. Passengers on package tours should contact their tour operator to find out whether their flight will be cancelled or postponed because of the strike. Can I take alternative transportation? The airlines have an obligation to inform you as quickly as possible about your flight cancellation and find you an alternative transportation. The airlines often try to use their subsidiaries to cover flight cancellations by moving passengers to flights operated by these airlines. If your flight is cancelled due to a strike, however, you can also contact your airline yourself to change your booking free of charge or, if you wish, you can cancel it completely. If it is a domestic flight that has been cancelled, it might be worthwhile taking a train or bus instead. You can arrange for your flight ticket to be changed by the airline to allow you to travel on a train or a bus. You can do this free of charge at the airline’s ticket counter or online via the airline’s booking page. If you go ahead and buy your own train or bus ticket, you should be careful. If the trip turns out to be more expensive than the flight you had originally planned, you might end up having to make up the difference. Make sure that you keep your flight ticket invoice. The safest thing to do is to get the airline to convert your flight ticket into a train ticket before you set off. The question as to whether the airline will reimburse you for the cost of a rental car is a matter of negotiation. If the airline promises to do so, make sure that it confirms the promise in writing. How can I claim my compensation? Figuring out whether you qualify for compensation can be tricky at the best of times. This difficulty only increases in cases of strike action. Moreover, many airlines do not inform their customers about their rights for compensation under European Regulation on Air Passenger Rights. Additionally they might ignore complaints, are difficult to reach or might even refuse to pay by referring to extraordinary circumstances. All this to discourage passengers who want to exert their rights. With Flightright at your side, you significantly improve your chances of receiving compensation. With our knowledge and expertise we’ll be far better equipped to establish the validity of your claim, and a far likelier to retrieve a payout from the airline. Our claim check calculator is the first step towards attaining the compensation you’re owed. Enter your details below to find out how much compensation you can get. If the strike action at the airport brings delays of at least 5 hours, you are legally entitled to withdraw from your flight. In this event you would also be due a refund from the airline, on the provision that you haven't taken any alternative transportation offered by them. If strike action leads to the postponement of your flight until the following day, the airline has an obligation to see that you are accommodated in a hotel for the night. The cost of the transport to and from the hotel and airport is also theirs to bear. Checklist: When are you not entitled to compensation in case of strike? Even the most punctual airline is powerless when ash clouds, severe storms or fog come into play. Scenarios like these are classed as “extraordinary circumstances”, meaning that the airlines are not responsible for them. We show you the main weather judgments and what you are entitled to nevertheless. As a rule, airlines that are not to blame for a delayed departure themselves are under no obligation to pay compensation. This applies in “extraordinary circumstances”, for example. But what sort of scenarios exactly count as these sudden, unavoidable events? We have put together information on the most important judgments for you. The European Parliament and the European Council adopted EU Regulation 261 back in 2004.The Regulation sets out provisions governing what air passengers are entitled to if they are denied boarding or if their flight is cancelled or affected by a major delay. We have put together all of the most important information on the Regulation and how the airlines try to get around it. British Airways, Lufthansa, American Airlines, Air France, Virgin Atlantic, United Airlines, Turkish Airlines.